Anna Mae Flynn, Big Blue Adventure Ambassador, entered the ultra running scene after her debut at WTC 50k 2015, where she placed 4th and clocked a time of 4hrs, making the ” top 10 all time female ever for the course”. She comes from a college running background, and has a 5k pr of 16:45. 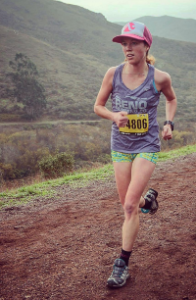 She raced to a 2nd place at the half marathon at TNF in 2014. She is finding the ultra world invigorating, and running longer distances is a new found passion. In 2015 she placed 2nd in the Aspen power of four 50k, 1st in the Red Bull Rise Aspen, 5th at the Rut 50k, 1st Vert Sky Race nationals, 3rd Moab USATF marathon Nationals. Anna Mae trains in the mountains of Lake Tahoe, and is a Salomon athlete. She is determined to run higher peaks, explore new trails and be challenged by competition.